3. Make changes to explorer.bak (initial location can be found by searching for the string 05 00 53 00, as well as 05 00 73 00, (one for Start and one for start). 4. Then you would have to reboot into command line and then copy over the explorer.bak to the explorer.exe, this is where I would deviate. Simply open a command prompt and navigate to C:\Windows>. Next, Open your task manager (control alt delete, sometimes it will bring it up or sometimes it will bring up a little window that you can simply click on the button). image name at the top. 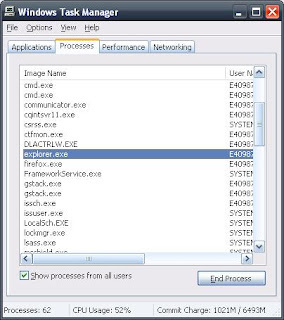 Finally you would just click on the Applications Tab in the Task Manager, and select New Task, and type in explorer, it should start up, and you'll see your start bar, and there you are with your fancy new start menu. I would say once you know how to do the above steps it takes like maybe 15 seconds to do all of it, which is MUCH faster then shutting down your machine and restarting just to see a small change. I changed mine to my name, the only problem I have is that when I saved it I tried to find it again, that wasn't nearly as easy, fortunately I am a bit of a troubleshooter.... so here's a tip. Those are the two addresses that I found my numbers at, so now in your "modified" explorer.bak, just open it up and find that address and right in that area you should see your modified start name, make any changes you would like and follow the tip I gave to check out the results. This tip is great because you can make changes and take a look and then jump right back to it without having to know the hex code you changed it to.